Also, "measured in mass" is a novel way of measuring design completion. You see, that's the kind of thing that I loath about Big Corporations that make their living sucking on the government teat. "Novel" doesn't even come close. That is such a B.S. metric that I can't believe that anybody would stoop that low to actually say such a thing in public. It is incredibly imbecilic and simpleminded and reflects incredibly poorly on the management and company that fostered it. I really feel for the incredibly talented and hardworking men and women who work for that company and now have to shamefacedly face their friends, families and neighbors and try to explain to them what that "novel" metric actually means. How do you defend such an incredibly dense statement by people who are supposed to be grownups? Maybe it's just a fun way of measuring progress trotted out for public consumption. Reuters is mainstream media, not L2. As an internal metric it's not useless, it helps you know how safe your mass margins are. Maybe Ferguson is actually a passionate guy, leading a relatively small team inside a much larger organization. Maybe he's got a real connection to the work and client. Maybe he really cares about the people who work for him. I like Ferguson, and I think he shoots straight. You think Musk and Sirangelo haven't been feeding us carefully qualified half truths? It frustrates me that people can just slag the guy and nobody cares. Quote was from Mulholland. Everything I said still applies. What's the pressurized volume of a CST-100? People are estimating 16-20m3 (I bet usable volume is maybe half that? I'm too tired to fire up CAD right now). I've seen "more than 1100kg" and "up to 1300kg" for cargo capacity. [Boeing VP and program manager John] Mulholland said, measured in mass, the Boeing design for the cargo module was 96-percent complete at the time of the review, while its design for the crew module was 85-percent complete, two metrics that underscored the maturity of the design. Measured by mass, I have personally completed more than 90% of the design of my new rocket, which will replace both the Atlas V and the Falcon 9.1. I've decided to use RP-1 and LOX. FWIW, I've seen "percent completed by mass" used before in aerospace. It was idiotic then and is idiotic now, but the Boeing exec did not invent it. That said, Boeing charged the most, delivered the least, played politics, and demonstrated lack of commitment. It's worked for them in other contexts in the pasts, but the times, they are a-changin'. HOUSTON, Aug. 21, 2014 – Boeing [NYSE: BA] recently completed the Phase Two Spacecraft Safety Review of its Crew Space Transportation (CST)-100 spacecraft and the Critical Design Review (CDR) of its integrated systems, meeting all of the company’s Commercial Crew Integrated Capability (CCiCap) milestones on time and on budget. The reviews were Boeing’s final two milestones in the current phase of its partnership with NASA. Completed in July, the CDR milestone marks a significant step in reaching the ultimate design that will be used for the spacecraft, launch vehicle and related systems. Propulsion, software, avionics, landing, power and docking systems were among 44 individual CDRs conducted as part of the broader review. 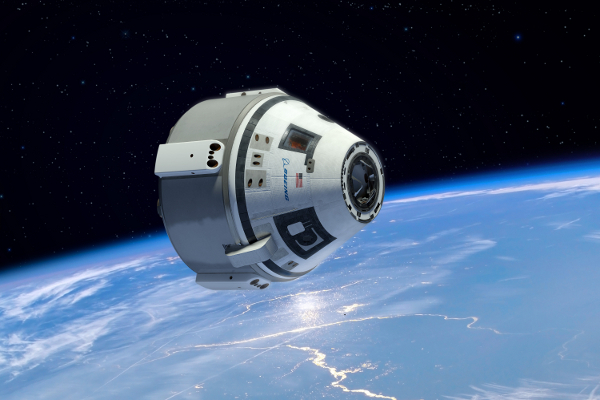 The CST-100 is being developed as part of NASA’s Commercial Crew Program, which aims to make crew transportation systems available for low-Earth orbit destinations such as the International Space Station by 2017. The capsule could accommodate up to seven crew members or a mix of crew and cargo and features a weld less structure, wireless internet and Boeing LED “Sky Lighting” technology. More information about the future of human space exploration can be found at www.beyondearth.com. If you don't think people jump on any perceived weaknesses in anything Musk and Sirangelo say, you haven't been paying much attention. The NSF forums are equal-opportunity bashers. Anyway, whether people also question the statements of Musk and Sirangelo is irrelevant. If there's a weakness in what Ferguson says, it's perfectly legitimate to make a point of that. If you have an issue with people not doing that to Musk or Sirangelo, bring it up yourself in the appropriate parts of the forum. Ferguson may be a great guy in all sorts of ways, but that's really irrelevant to how people react to a particular statement he made. If he made a dumb statement, I'm glad people are calling him on that, as they should on any dumb statement someone in a position of authority publicly makes. ISTM the problem with CST-100 for COTS-2 is a small hatch and lack of an unpressurized cargo bay like Dragon's trunk. Adding the latter would have to be a service module extension, and that would cover the circular solar panel at its bottom. It would also add even more mass, perhaps requiring at least one more $RB. Seems by using an expensive, disposable service module instead of integrating it like DV2 & DC they've painted themselves into a corner. I do not get this fascination with unpressurized cargo. There is no indication that NASA needs a lot of it. The retiring ATV has no unpressurized cargo capability. Volume and re-boost are its two big features. The current ATV caries over 4 mt of fuel for re-boost plus almost a ton of transfer fuel. Please do not take those numbers too seriously. At best they are a guess. I have no idea if they are correct. In 2011 they said 1164 kg and 7 crew. Again old so trust level is low. I think a CST-100 derived freighter would compete much better against Orbital than it would SpaceX. Cygnus already has a smaller hatch diameter and no unpressurized cargo capacity, and as of COTS-1, is significantly more expensive than Dragon. I'd think it's the other way around. Cygnus covers the bulky cargo and trash disposal. You are correct about the unpressurized cargo of course. Cygnus could go to a full sized CBM hatch if desired, CST can't. The proposal is out there to turn Cygnus into a (perhaps not reusable) return capsule, via a HIAD, in the HEART test. I can't find anything from the HIAD team less than a year old though, despite the fact that they should have been on the PR warpath for IRVE-4 this past spring. The Cygnus team also seems pretty damn flexible as far as the scale of their 3m diameter tin can. The 2-segment craft is being replaced by a 3-segment 'enhanced' craft as they develop Antares further, with a 4-segment craft proposed if anyone wants to fund it, and I think there were whispers of an even longer one. I have to wonder what they would charge under a commercial contract for a 4.5m diameter tin can to launch on Falcon Heavy... and whether it would be substantially cheaper than the Japanese and European entrants. Not really a viable idea. 2. If there was a need, Spacex would do something similar. 3. OSC doesn't manufacture the pressurized modules. The Italian pressure vessel manufacturer has made the 4.5m Spacehab modules, Nodes, MPLM's, Columbus, ATV modules; and they or somebody else could make the spacecraft vs OSC. ESA is out of the ATV game at this point, and ISTM Japan's HTV 2 plans may hinge on if they choose to fly Dream Chaser or not. Don‘t underestimate the importance of CST00 being able to boost the ISS, as of now NASA are totally reliant on Progress. With no LAS needed a cargo CST00 propulsion module can carry substantially more fuel, only limitation being LV payload. The problem, as has been discussed to death elsewhere, is the direction and strength of that thrust. If the CST-100 is docked where the Shuttle used to be, it cannot pull the ISS because the exhaust from the thrusters would impinge on the station itself. It can only push the ISS if the station is spun around to face the opposite of its normal direction (American end towards the direction of the orbit). The strength is another matter. You can't have a brute force rocket like a LAS doing the work, as the ISS wasn't designed to handle such accelerations, or such force being transmitted through the docking adapter. Point 1. Since when is this a problem? This (rotation of ISS for reboost) always happened for Shuttle reboosts. ISS will also change attitude for some docking events. (1) Depends on how much a pain in the neck doing that flip is. It would have been less of a problem when the station was less complete. I find no record of the last shuttle flight having done this, and it would have made sense to do it on that mission, of all missions. Do we know when was the last time the Shuttle reboosted the ISS? In any case, I was under the (perhaps mistaken) impression the Shuttle could pull the ISS because of how far outboard the RCS nozzles were (compared to those of a capsule). (2) Question: It sounds like, from what you're saying, that they did indeed elect to have a pusher escape system for the CST-100? Wikipedia indicated that it was decided upon, but didn't say what they chose. Artwork out on the web shows the service module both with and without nozzles on it. We need some real astronauts on this forum. They would KNOW. About 1... No, Shuttle never "pulled" ISS. Where did you get this from? About 2... Yes, CST-100 has a pusher escape system. By definition, since it is located in the SM. How else do you think CST-100 would be able to dock to ISS with a "puller" LAS still attached? 3. We need some real astronauts on this forum. They would KNOW. 1. Not really, the shuttle helped. The shuttle used downward firing thrusters. Never said it would have a puller LAS still attached. Those fly away. Anybody who has lived through Mercury, Gemini and Apollo (and paid any attention) knows that much. Uninformed question: Why does Boeing's CST-100 completed Milestones not need aborts and other features that SpaceX or Sierra Nevada need to include? Milestones for CCiCap were agreed upon through negotiations between NASA and the CCiCap competitors.